With A's sweet tooth more of a savoury one, I often have to go it alone on the pudding front. It is no problem. I'll happily take one for the team tum. This chilly, dark weeknight I craved a comfort pud. Apple Crumble in a Cup, the oven is yours. Yep, rather than bake a crumble in a massive pie dish, Crumble in a Cup is the easy-slumped-on-the-sofa-convenient-mini version. And to add a little twist to such a classic favourite I've drowned the crumble in white chocolate custard. 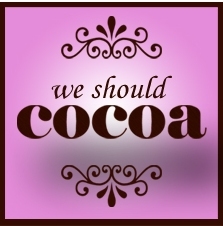 Which fits in very nicely with the theme for this month's We Should Cocoa challenge: apples. This brilliantly chocolatey cooking challenge is hosted this month by Chele from The Chocolate Teapot. Excuse the rubbish picture above. It was dark. What a brilliant idea! Definitely trying this again .... and again! wheel is misguided. So I don't think I'd get away with making a single cup. You have got it sussed with this crumble in a cup. I happen to have the very same star mugs myself but in red, so I now have to go and put your recipe to the test! What a fantastic idea, perfect portion control! I love the idea of White chocolate custard, I think it wil be a great hit in my house. Ooh never mind the crumble, I want to try white chocolate custard. Well, I didn't really mean that cos I love crumble and your idea of baking it in a mug is a great one - only how do you tell if the cup will take the heat? Luckily for me, CT is happy to eat pretty much anything I put in front of him, but making a batch of these for friends at dinner would be fun.